Bundled with Minecraft, Forza Horizon 3 and Sea of Thieves, the new Xbox One S All-Digital Edition is already available for pre-order at US$249.99 — US$50 less than the Xbox One S. Just as previously rumored, the disc-free console will be available worldwide — both online and in stores — on May 7. After surfacing in so many leaks and rumors over the last few months, there was not really much left to uncover regarding the Xbox One S All-Digital Edition. Now, Microsoft's latest gaming console is finally official and those interested can place their pre-orders for US$50 less than the price of the Xbox One S — a difference that Microsoft expects to maintain in the future as well. The Xbox One S All-Digital Edition comes bundled with three of the most popular titles currently in Microsoft's portfolio, namely Minecraft, Forza Horizon 3, and Sea of Thieves. While there is no new Xbox subscription offering to talk about yet, Xbox Game Pass now comes with the first three months of membership for just US$1, followed by a monthly cost of US$9.99 from the fourth month forward. In addition to gaming, the new console can be used to watch 4K HDR content from Netflix, Amazon, and other similar services. 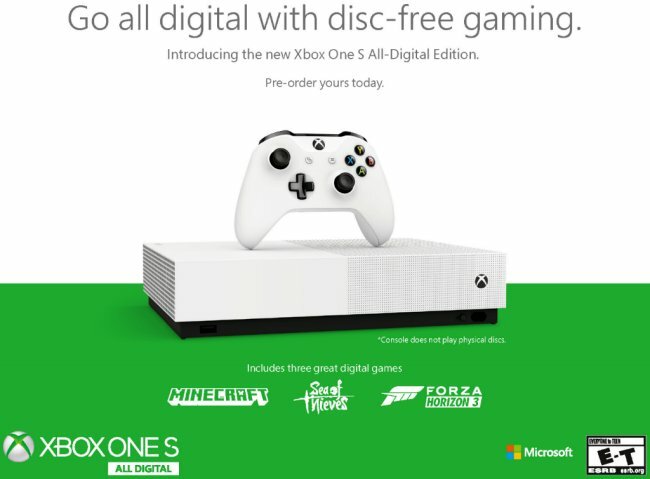 Obviously, the three titles mentioned above are only a drop in an ocean: Xbox One S All-Digital Edition users can access over 100 games via Xbox Game Pass and thousands of titles can be acquired from the Microsoft Store. 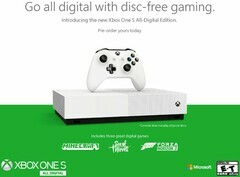 The Xbox One S All-Digital Edition goes for US$249.99 and can only be pre-ordered from Microsoft Store locations and online, but select retailers worldwide — including Best Buy, Amazon, and Walmart — will add it to their portfolio on May 7, as rumored.